Spring® clutch for automatic self- adjustment and constant plate load throughout the wear life of the unit. PTO applications, and gives de- tailed instructions for PTO selec- tion. 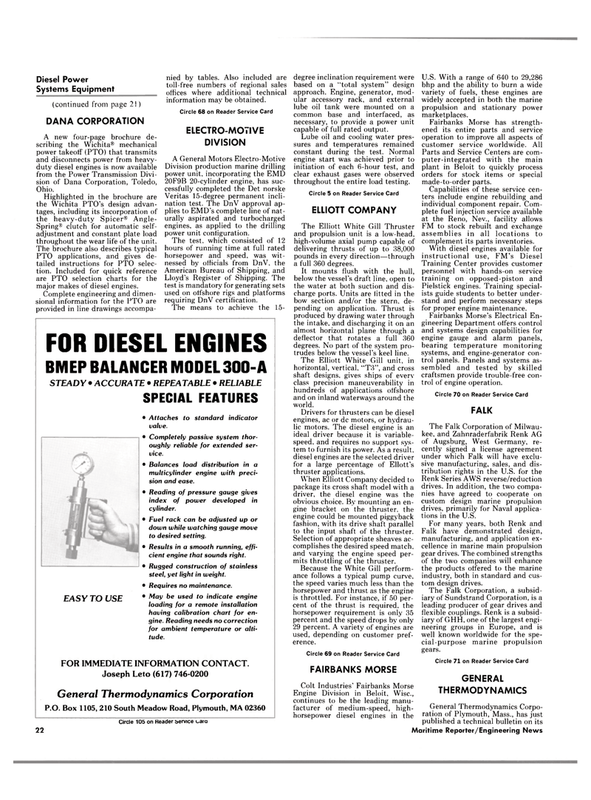 Included for quick reference are PTO selection charts for the major makes of diesel engines. Complete engineering and dimen- sional information for the PTO are provided in line drawings accompa- nied by tables. Also included are toll-free numbers of regional sales offices where additional technical information may be obtained. Veritas 15-degree permanent incli- nation test. The DnV approval ap- plies to EMD's complete line of nat- urally aspirated and turbocharged engines, as applied to the drilling power unit configuration. Lloyd's Register of Shipping. The test is mandatory for generating sets used on offshore rigs and platforms requiring DnV certification. EASY TO USE • Attaches to standard indicator valve. • Completely passive system thor- oughly reliable for extended ser- vice. • Balances load distribution in a multicylinder engine with preci- sion and ease. • Reading of pressure gauge gives index of power developed in cylinder. • Fuel rack can be adjusted up or down while watching gauge move to desired setting. • Results in a smooth running, effi- cient engine that sounds right. • Rugged construction of stainless steel, yet light in weight. • Requires no maintenance. • May be used to indicate engine loading for a remote installation having calibration chart for en- gine. Reading needs no correction for ambient temperature or alti- tude. Circle 105 on Header bervice uaru degree inclination requirement were based on a "total system" design approach. Engine, generator, mod- ular accessory rack, and external lube oil tank were mounted on a common base and interfaced, as necessary, to provide a power unit capable of full rated output. Lube oil and cooling water pres- sures and temperatures remained constant during the test. Normal engine start was achieved prior to initiation of each 6-hour test, and clear exhaust gases were observed throughout the entire load testing. The Elliott White Gill Thruster and propulsion unit is a low-head, high-volume axial pump capable of delivering thrusts of up to 38,000 pounds in every direction—through a full 360 degrees. It mounts flush with the hull, below the vessel's draft line, open to the water at both suction and dis- charge ports. Units are fitted in the bow section and/or the stern, de- pending on application. Thrust is produced by drawing water through the intake, and discharging it on an almost horizontal plane through a deflector that rotates a full 360 degrees. No part of the system pro- trudes below the vessel's keel line. The Elliott White Gill unit, in horizontal, vertical, "T3", and cross shaft designs, gives ships of even- class precision maneuverability in hundreds of applications offshore and on inland waterways around the world. Drivers for thrusters can be diesel engines, ac or dc motors, or hydrau- lic motors. The diesel engine is an ideal driver because it is variable- speed. and requires no support sys- tem to furnish its power. As a result, diesel engines are the selected driver for a large percentage of Ellott's thruster applications. When Elliott Company decided to package its cross shaft model with a driver, the diesel engine was the obvious choice. By mounting an en- gine bracket on the thruster. the engine could be mounted piggyback fashion, with its drive shaft parallel to the input shaft of the thruster. Selection of appropriate sheaves ac- complishes the desired speed match, and varying the engine speed per- mits throttling of the thruster. Because the White Gill perform- ance follows a typical pump curve, the speed varies much less than the horsepower and thrust as the engine is throttled. For instance, if 50 per- cent of the thrust is required, the horsepower requirement is only 35 percent and the speed drops by only 29 percent. A variety of engines are used, depending on customer pref- erence. U.S. With a range of 640 to 29,286 bhp and the ability to burn a wide variety of fuels, these engines are widely accepted in both the marine propulsion and stationary power marketplaces. Parts and Service Centers are com- puter-integrated with the main plant in Beloit to quickly process orders for stock items or special made-to-order parts. FM to stock rebuilt and exchange assemblies in all locations to complement its parts inventories. Pielstick engines. Training special- ists guide students to better under- stand and perform necessary steps for proper engine maintenance. Fairbanks Morse's Electrical En- gineering Department offers control and systems design capabilities for engine gauge and alarm panels, bearing temperature monitoring systems, and engine-generator con- trol panels. Panels and systems as- sembled and tested by skilled craftsmen provide trouble-free con- trol of engine operation. Renk Series AWS reverse/reduction drives. In addition, the two compa- nies have agreed to cooperate on custom design marine propulsion drives, primarily for Naval applica- tions in the U.S.
Falk have demonstrated design, manufacturing, and application ex- cellence in marine main propulsion gear drives. The combined strengths of the two companies will enhance the products offered to the marine industry, both in standard and cus- tom design drives. The Falk Corporation, a subsid- iary of Sundstrand Corporation, is a leading producer of gear drives and flexible couplings. Renk is a subsid- iary of GHH, one of the largest engi- neering groups in Europe, and is well known worldwide for the spe- cial-purpose marine propulsion gears.